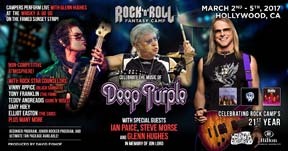 March 2nd - 5th, 2017 in Hollywood CA - Spend 4 days immersed in the music that made Deep Purple a true rock and roll icon. From MACHINE HEAD to BURN to PERFECT STRANGERS and more, jam the songs from the albums plus a live performance at the legendary WHISKY A GO GO where you will perform with Glenn Hughes! Register by Nov 11th to receive your early bird discount or click here for more information. Gary will see you there!